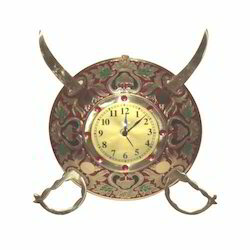 In order to meet excellent quality standards, we are supplying sword & dhaal clock in brass. Its unique and gives Royal look in drawing room, hall, conference hall etc.It comes in 8" -18". 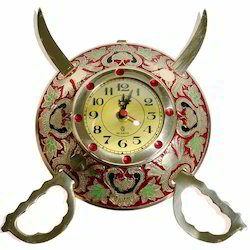 This Handcrafted traditional Rajputi Sword Armour design wall clock is made of pure brass. The gift piece has been prepared by the master artisans of Jaipur. We are amongst the most reputed names in the industry, offering Sword Armour Wall Clock. We are a top notch supplier of Sword & Guard Wooden Clock. This Handcrafted traditional Rajputi Sword Armour design wall clock is made of pure brass. This masterpiece utility item can be used as a show-piece in your drawing room. It is also an ideal gift for your friends and relatives. We are amongst the most reputed names in the industry, offering Sword Clock.